Resolutions expressing the feelings and sentiments of the General Council of the Choctaw Nation in reference to the political disagreement existing between the Northern and Southern States of the American Union. 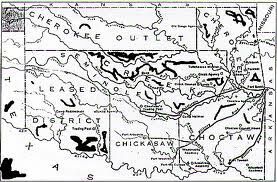 Resolved by the General Council of the Choctaw Nation assembled, That we view with deep regret and great solicitude the present unhappy political disagreement between the Northern and Southern States of the American Union, tending to a permanent dissolution of the Union and the disturbance of the various important relations existing with that Government by treaty stipulations and international laws, and portending much injury to the Choctaw government and people. Resolved further, That we must express the earnest desire and ready hope entertained by the entire Choctaw people, that any and all political disturbances agitating and dividing the people of the various States may be honorably and speedily adjusted; and the example and blessing, and fostering care of their General Government, and the many and friendly social ties existing with their people, continue for the enlightenment in moral and good government and prosperity in the material concerns of life to our whole population. Resolved further, That in the event a permanent dissolution of the American Union takes place, our many relations with the General Government must cease, and we shall be left to follow the natural affections, education, institutions, and interests of our people, which indissolubly bind us in every way to the destiny of our neighbors and brethren of the Southern States, upon whom we are confident we can rely for the preservation of our rights of life, liberty, and property, and the continuance of many acts of friendship, general counsel, and material support. Resolved further, That we desire to assure our immediate neighbors, the people of Arkansas and Texas, of our determination to observe the amicable relations in every way so long existing between us, and the firm reliance we have, amid any disturbances with other States, the rights and feelings so sacred to us will remain respected by them and be protected from the encroachments of others. Resolved further, That his excellency the principal chief be requested to inclose, with an appropriate communication from himself, a copy of these resolutions to the governors of the Southern States, with the request that they be laid before the State convention of each State, as many as have assembled at the date of their reception, and that in such as have not they be published in the newspapers of the State. Resolved, That these resolutions take effect and be in force from and after their passage. Rather sad that they believed the Confederacy would offer them a fairer shake. The tribes were as divided as the rest of the nation. A sad time all around.